Swiss theologian Hieromonk Gabriel Bunge. 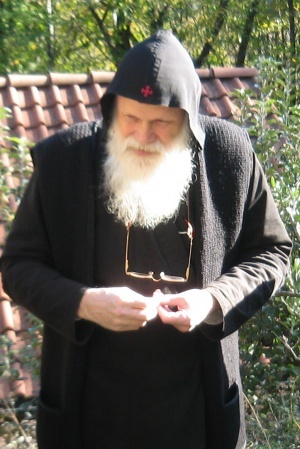 Hieromonk Gabriel Bunge (1940- ) is a renowned Swiss theologian and Patristics scholar who was formerly a Roman Catholic Hieromonk of the Order of Saint Benedict (O.S.B.) that was welcomed into the Orthodox Christian faith on August 27, 2010. Born in 1940 in Cologne, in 1962 he entered the Roman Catholic Benedictine monastery Chevetogne Abbey, in Belgium, and was ordained in 1972. Since 1980 he has been living the eremitical life in the Swiss mountains. As a Patristics scholar he has contributed numerous articles and books to spiritual and monastic journals, particularly on Evagrius Ponticus, providing translations of several of Evagrius’ works, including the Letters. On August 27, 2010 (according to the Julian Calendar), Fr. Gabriel converted to Orthodoxy in the presence of Department for External Church Relations (DECR) chairman Metropolitan Hilarion (Alfeyev) of Volokolamsk and Metropolitan Kallistos (Ware) of Diokleia during an All-Night Vigil at the Church of the ”Joy of All Who Sorrow” Icon, on Bolshaya Ordynka Street, in Moscow. While congratulating Fr. Gabriel on this move, Metr. Hilarion presented him with an icon of the Mother of God called “Joy of All the Afflicted”, to which the church in which Fr. Gabriel joined the Orthodox Church is dedicated. Fr. Gabriel continues to lead a hermit’s life in a small skete in Switzerland, never uses the Internet, and the only means of communication with him is the telephone. Gabriel Bunge at Polish Wikipedia. Eirenikon. Gabriel Bunge, OSB, received into Orthodoxy. September 2, 2010. Russian Orthodox Church - Dept. of External Church Relations (DECR). Metropolitan Kallistos of Diokleia and hieromonk Gabriel (Bunge) concelebrate All-Night Vigil with Metropolitan Hilarion of Volokolamsk at the church of “Joy to All the Afflicted” Icon of the Mother of God. 28.08.2010. Saint Vladimir’s Orthodox Theological Seminary. Renowned Benedictine Monk and SVS Press Author Joins Orthodox Church. Archpriest Pavel Velikanov. Father Gabriel (Bunge) “Orthodoxy is the Fruit of My Whole Life as a Christian and a Monk”. Transl. Svetlana Tibbs. Pravmir.com. Jan 25, 2011, 10:00. This page was last edited on November 9, 2012, at 17:11.